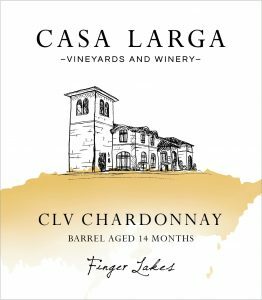 Our very popular CLV Chardonnay is fermented and aged in a blend of oak barrels to achieve a round mouth-feel and a beautiful balance of natural fruit and oak flavors. Viticulture notes. We grow four different clones (subspecies) of Chardonnay grapes at Casa Larga. The grapes for CLV Chardonnay are selected from one particular vineyard block. We machine harvest the crop to pinpoint the peak moment for ripeness and process the grapes immediately after picking to minimize the risk of oxidation. Fermentation. In a blend of American, French and Hungarian oak barrels. Primary fermentation is followed by malolactic fermentation. Winemaking notes. Small lots of Chardonnay juice are fermented in 225-liter barrels sourced from American, French and Hungarian oak forests. Each type of oak uniquely contributes to the wine’s aroma and mouth-feel, and blending the three types of oak allows for a more complex finished wine. Malolactic fermentation is monitored and arrested at a point that assures both a vibrant acidity and a round, full texture. We include grapes from various vintages in the blend to produce a consistent wine over time in spite of our variable climate. Crafting a non-vintage Chardonnay is one of the highest forms of winemaking artistry. Aging: Store at a cool temperature (55º-60ºF) and out of direct sunlight. This wine, like most Burgundy style white wines, was produced to be enjoyed while relatively young, i.e. within roughly 3 years of bottling. Tasting notes. Fermented and aged in a unique blend of American, French and Hungarian oak barrels, our CLV Chardonnay exhibits nuances of vanilla and spice and a toasty finish. Pairing suggestions. Seafood, poultry, and pasta with rich sauces, potatoes au gratin, brie and other creamy cheeses.